Engineered to work optimally with Android/iOS smartphones and tablets; MP3, MP4; iPod; PC; TV and other Bluetooth enabled devices within 33 feet, PLEASE make sure the driver software of receiving adapter is fully updated when connected to PC or laptop, and you need a SEPARATE Bluetooth adapter when connected with TV. 1. The exclusive authorized seller is Patozon. 2. 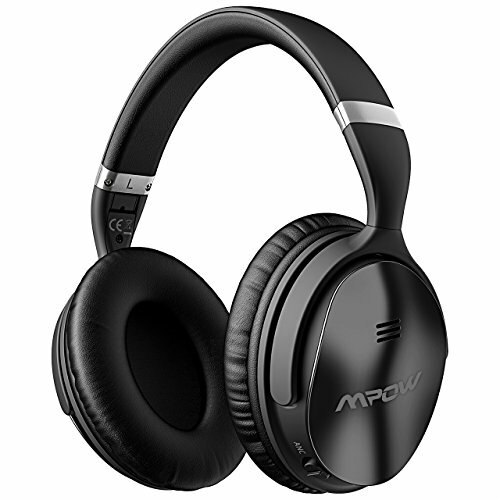 Active noise cancelling technology isolates yourself from external low-frequency noises like airplane cabin noise, city traffic or office air conditional. But CAN NOT eliminate human voices. 3. If you can't connect this headphones to your cell phones or other devices, please downloaded user mannual from the Product information's Technical Specification (Our Listing Frontpage) or ask us for a complete FAQ guidance of Bluetooth Headphones, you can find the solutions finally! 4. Depending on your head/ear size/shape, it may be a little tight (feels like “on ear”) for someone to wear which is designed to avoid sound leakage. In case of that and to get both audio and wearing comfort, please take off the headphone every 1-2 hrs to get your ears relax and protect them from muggy environment in use. 5. The Microphone only works in the wireless mode. 6. The headphone will be off when charged.